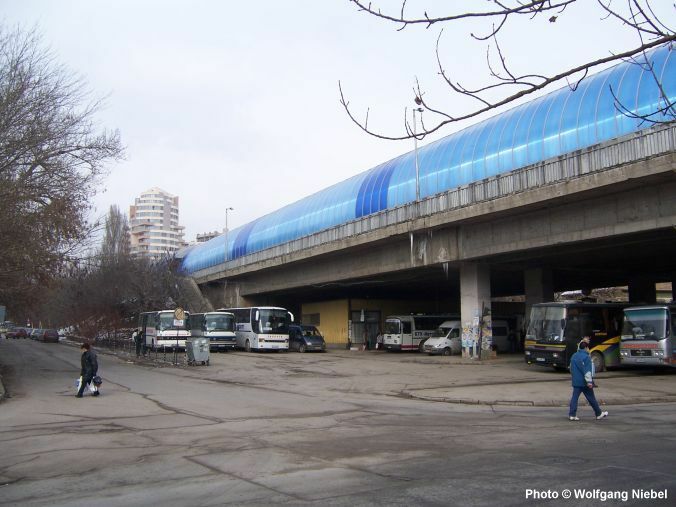 Bulgaria's capital has 1.3 million inhabitants and lies in the west of the country. 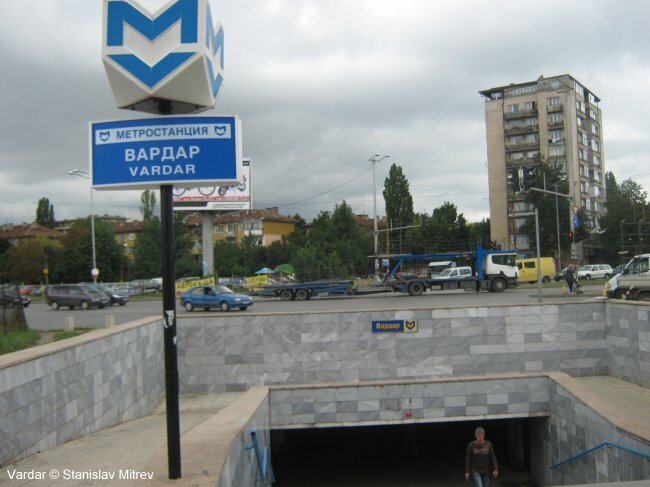 Due to ever increasing road traffic and a series of dormitory towns on the outskirts of the city traffic problems got worse in the old city centre where roads are narrow. 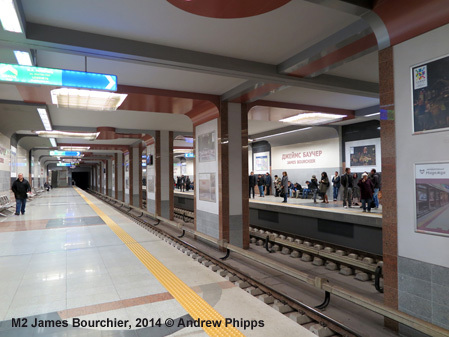 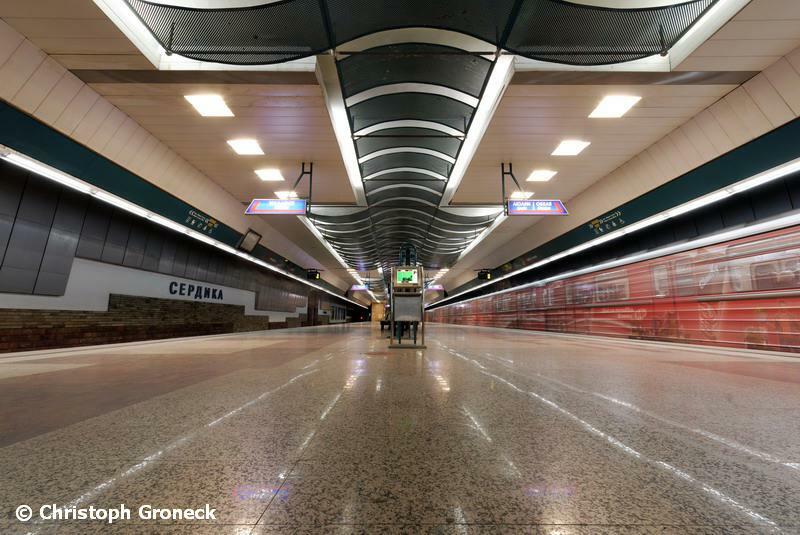 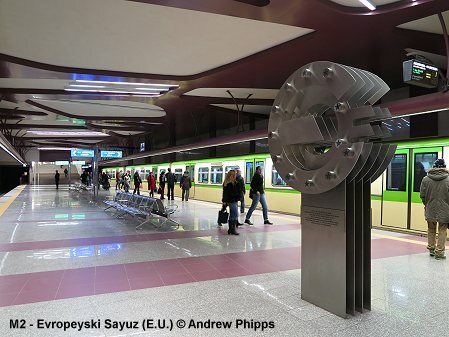 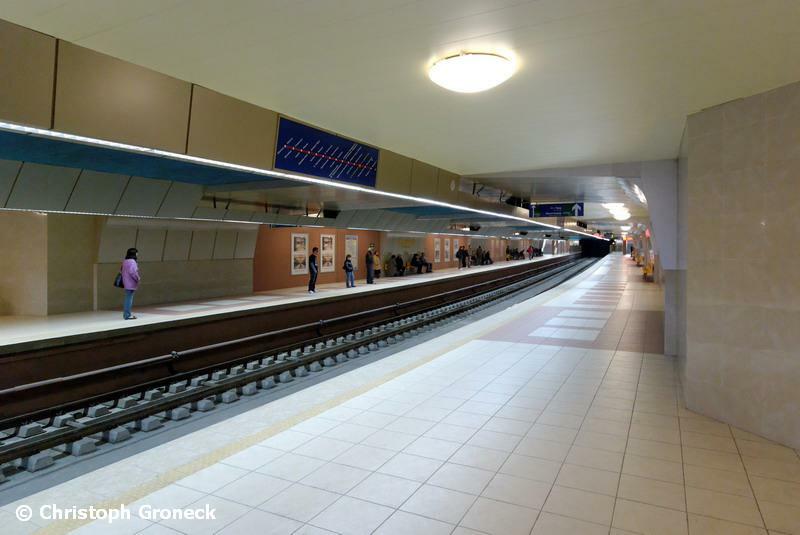 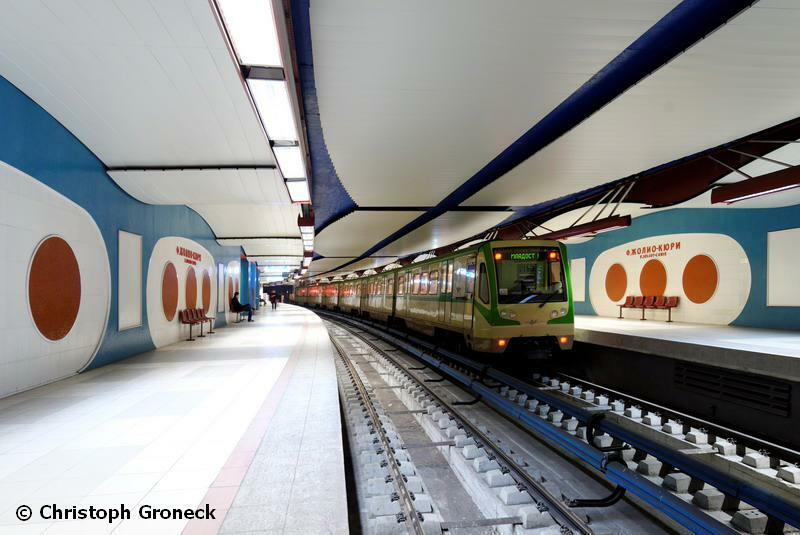 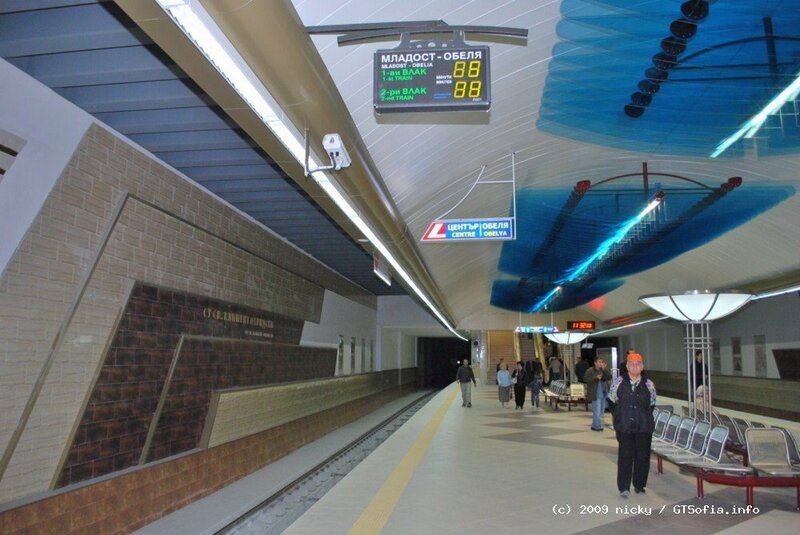 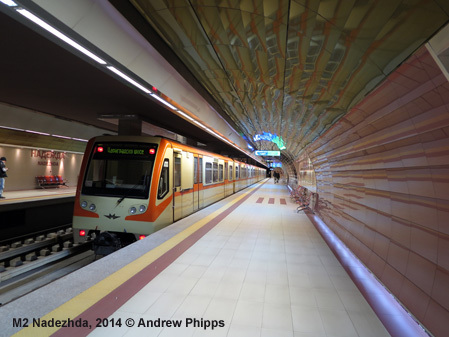 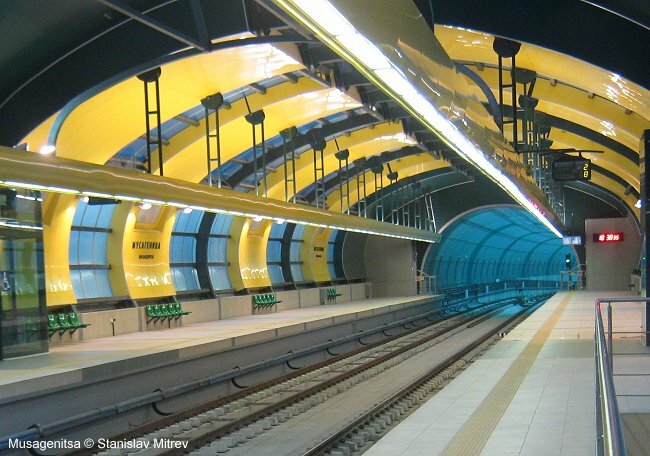 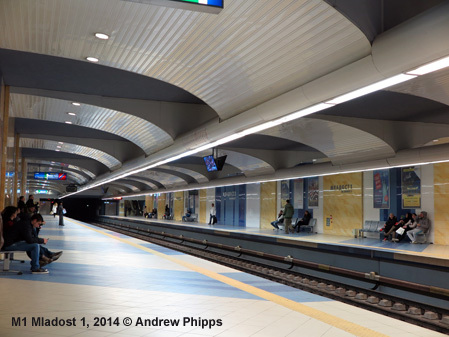 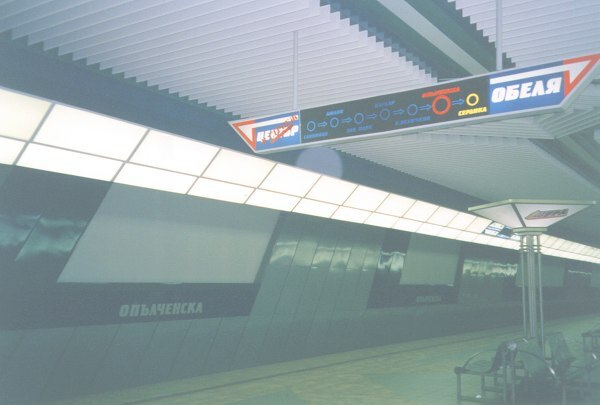 Therefore the Bulgarian government approved a master plan for the construction of a metro system following the three-diameter structure, with a total length of the lines estimated at 52 km. 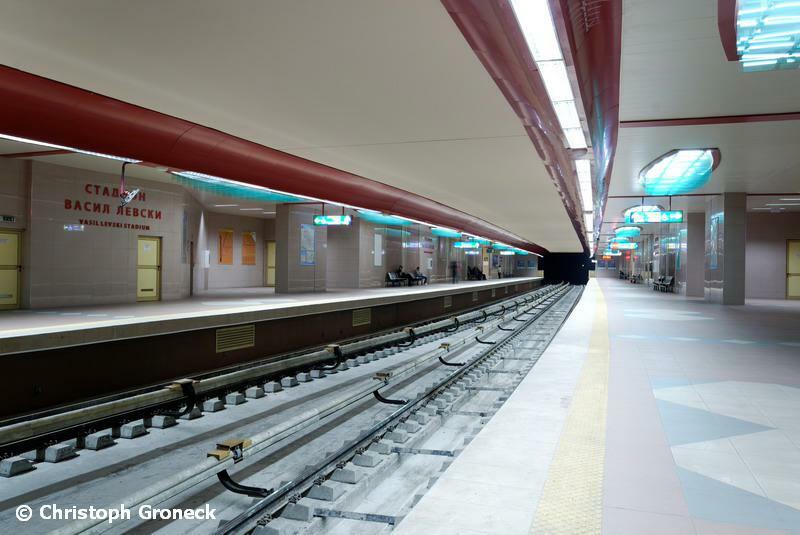 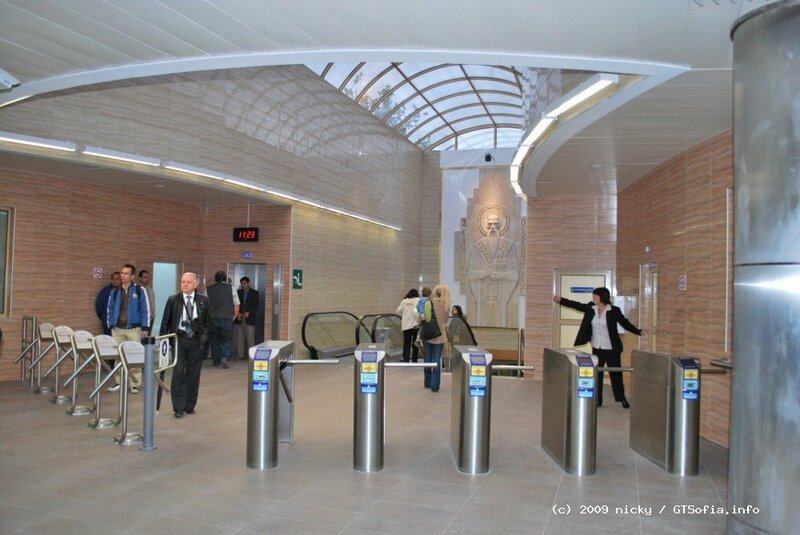 There will be 47 stations and the network will be able to carry more than 1 million people a day. 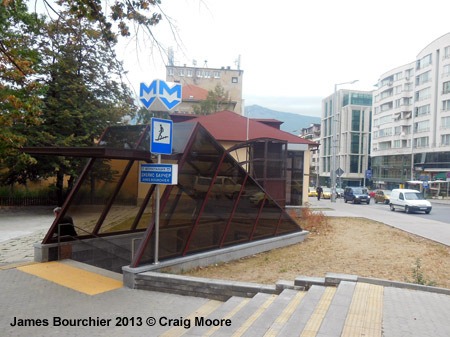 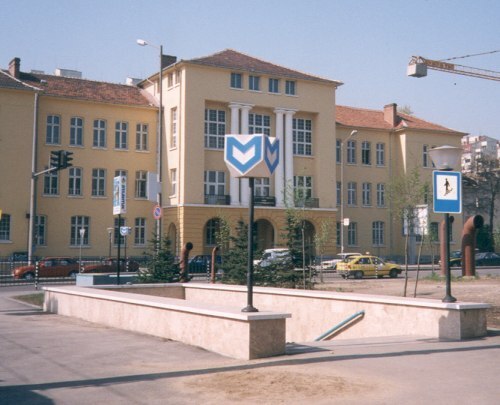 The first line runs from Obelya through Lyulin to the city centre and from there to Mladost. 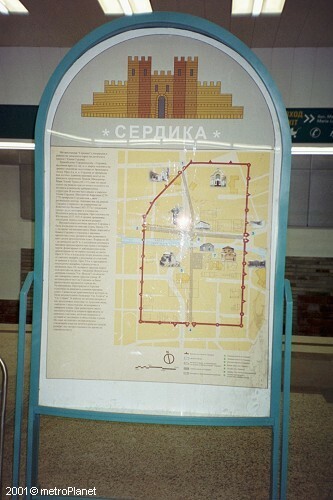 All three lines will eventually form a downtown triangle, marked by the St. Nedelya Square, the Kliment Ohridski University and the National Palace of Culture. 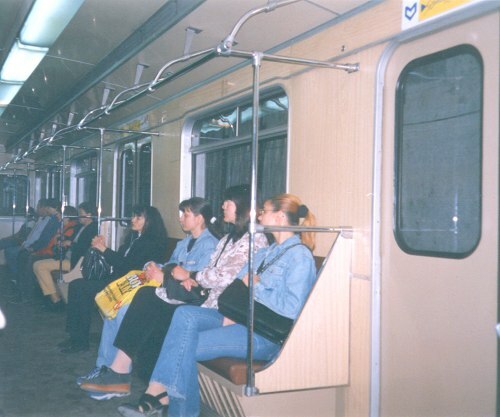 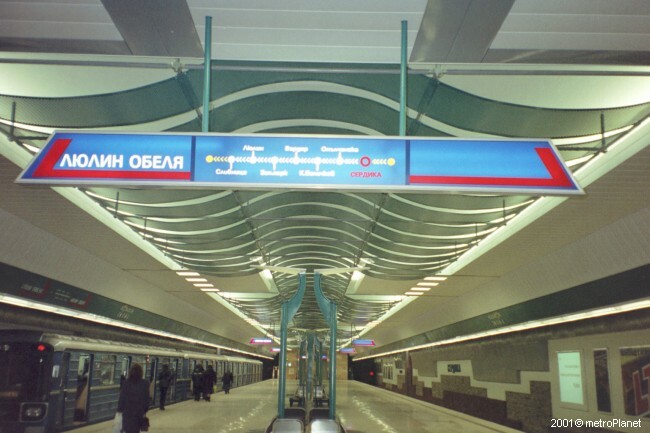 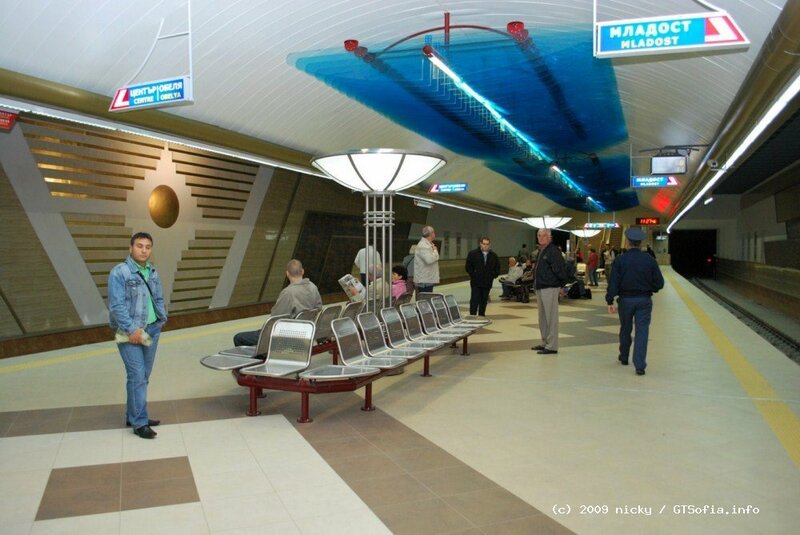 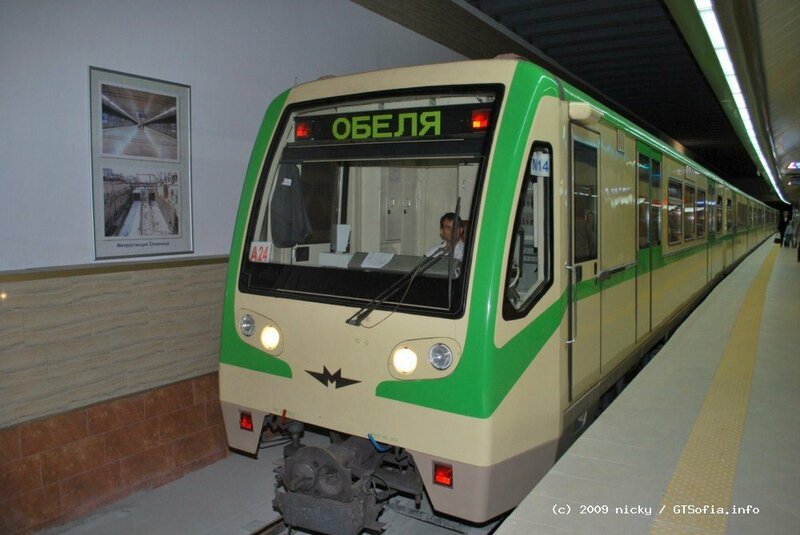 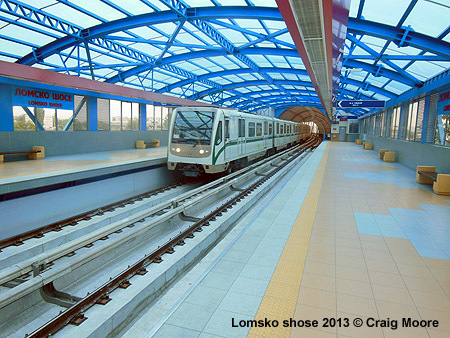 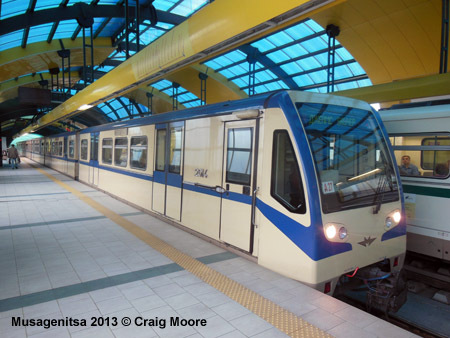 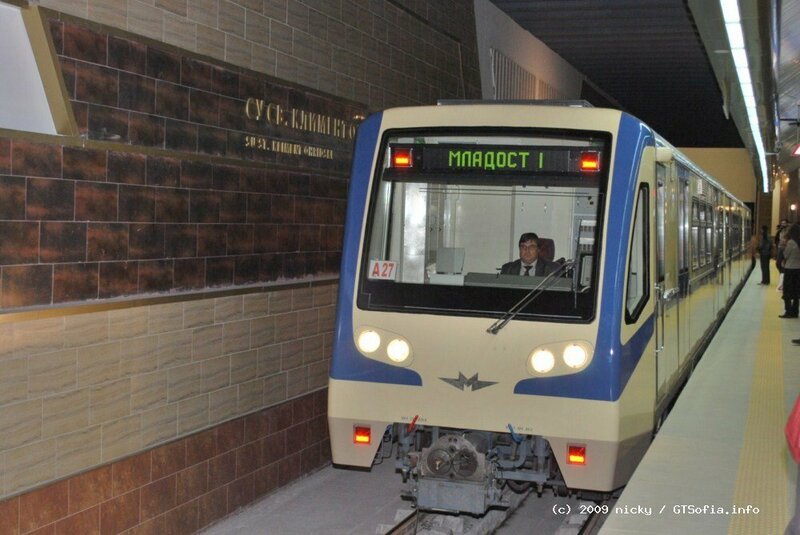 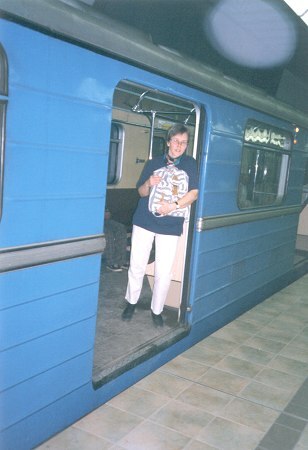 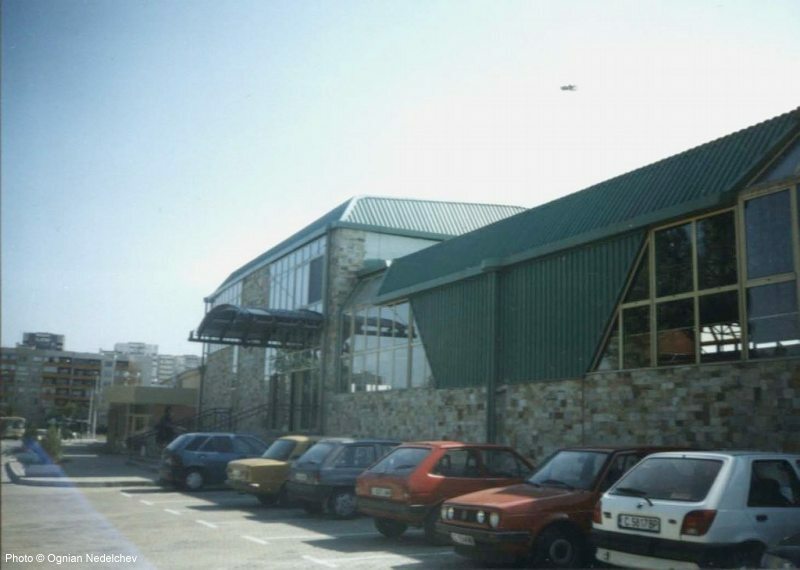 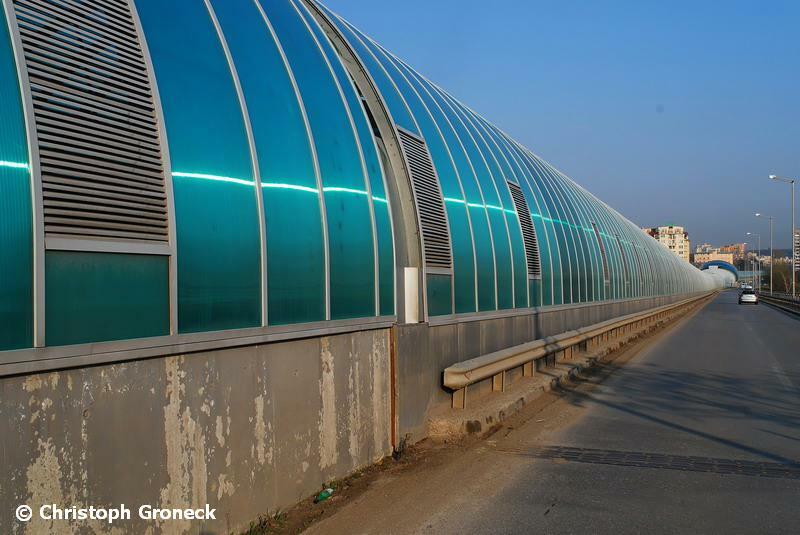 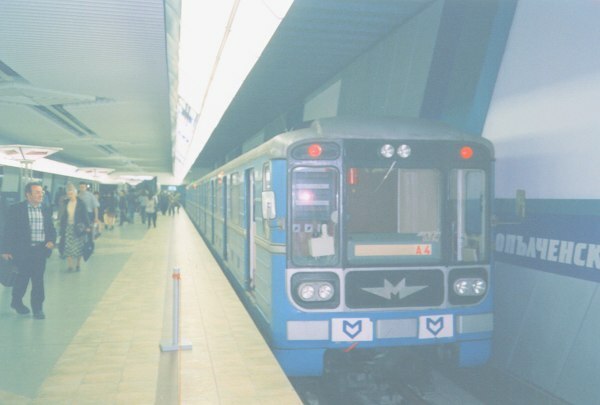 The first line opened after some 20 years of construction work on Jan. 28, 1998, with through operation from Obelya to Mladost finally starting in Sept. 2009. 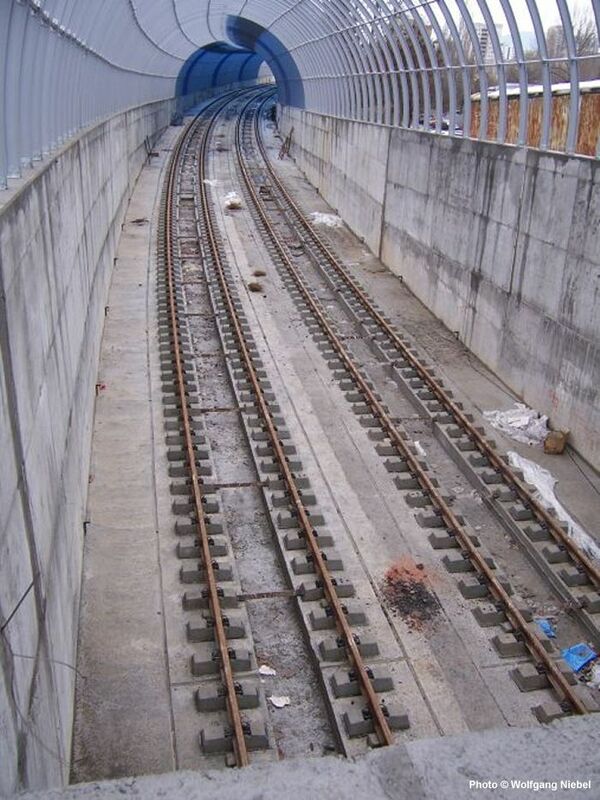 Average distance between stations is 1100 m; platform length - 105-120 m; operational speed of the trains is 90km/h; track gauge - 1435 mm; power supply - third rail at 825 V DC. 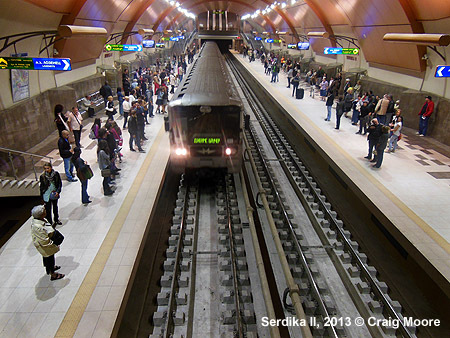 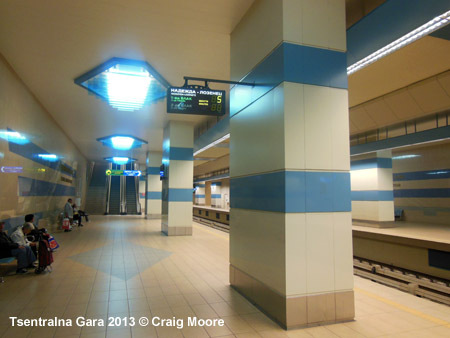 A second line, running north-south via the city main railway station, was built in only four years and opened in summer 2012. 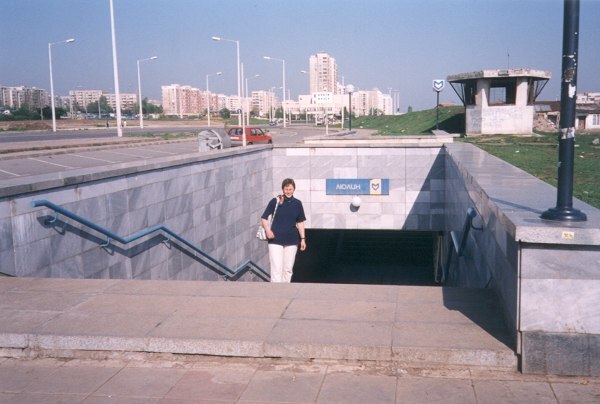 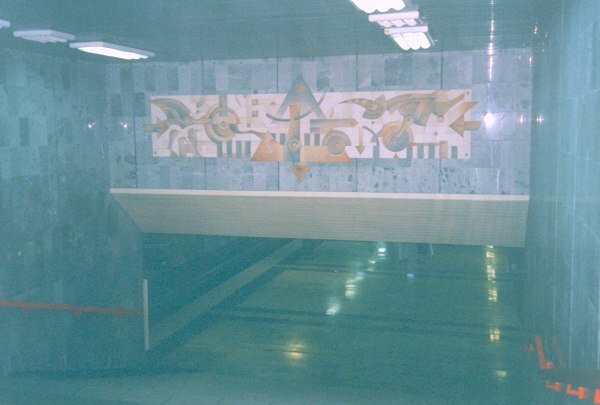 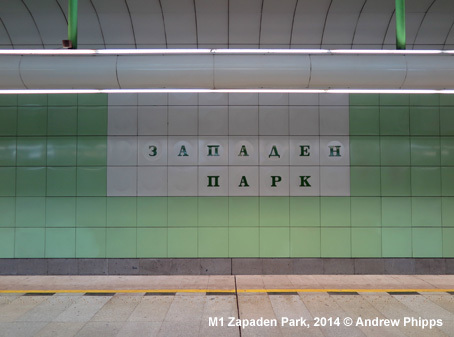 Two stations with the tunnel between them were constructed in the 1980s - "NDK" (National Palace Of Culture) and "Museum of the Earth and People" (HEMUS), the latter having eventually opened as "European Union" to honour the source of funds for this project. 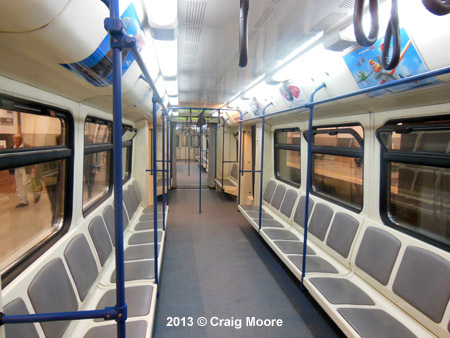 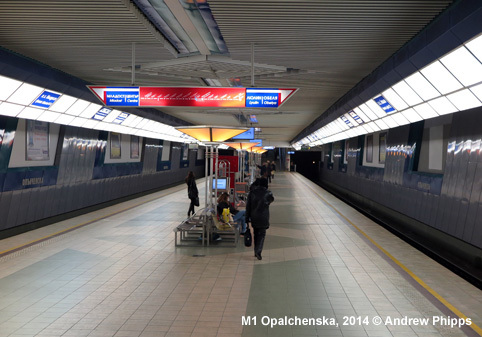 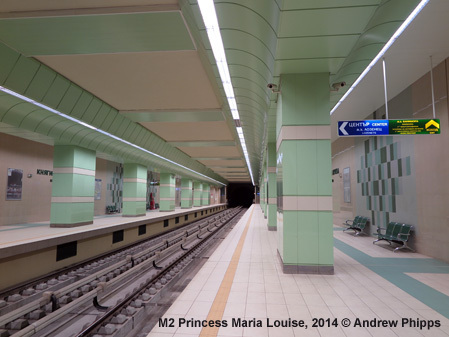 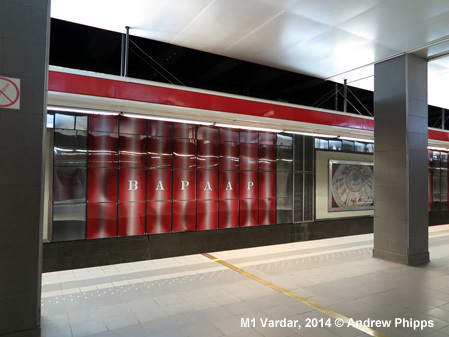 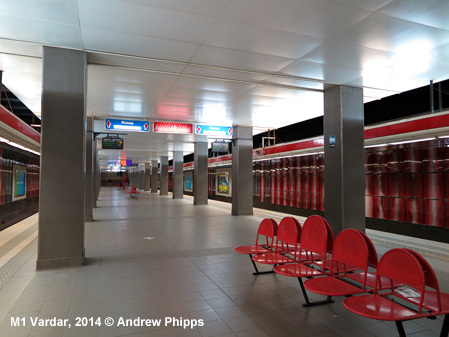 Line M3, instead of an original proposal for a 'light metro', will eventually also become a full-scale metro with 105 m long platforms, though designed with overhead power supply. 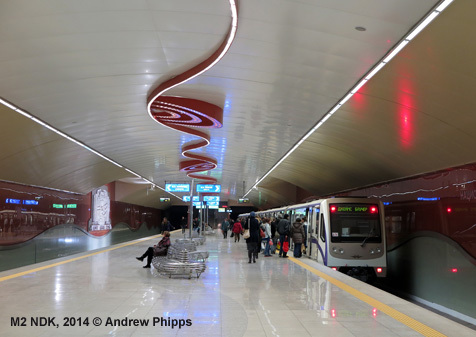 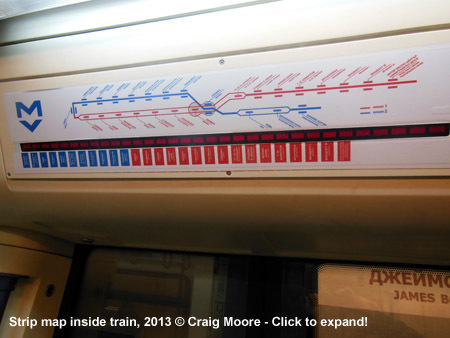 It will eventually be 16.5 km long and include 18 stations. 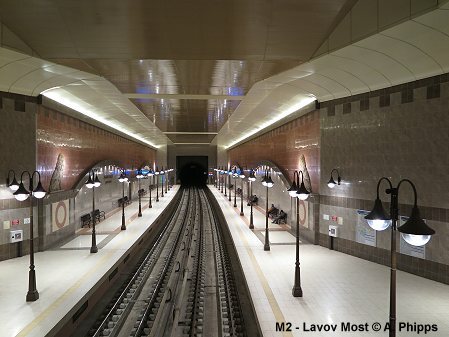 Construction of the western part started in 2016 and be finished by 2019. 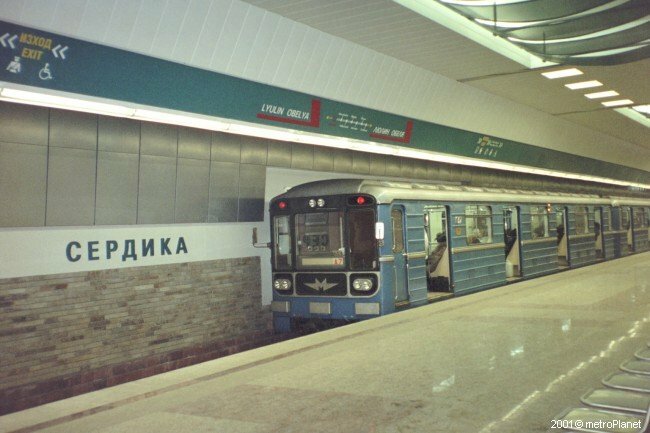 To be further extended east by 2027, with stations at Vasil Kanchev, Vasil Kanchev and Pop Gruyo; and eventually to Botevgradsko Shose/Avtostantsiya Iztok. 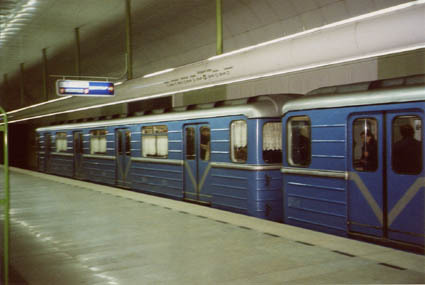 A branch with 5 stations is planned. 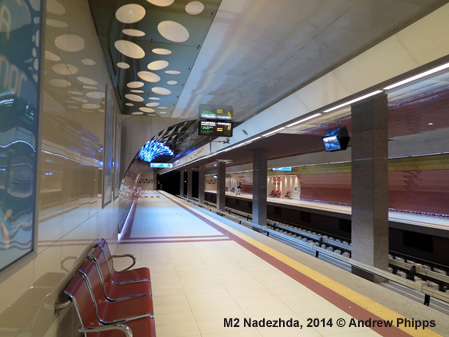 M3 will be operated with 30 Siemens Inspiro trains. 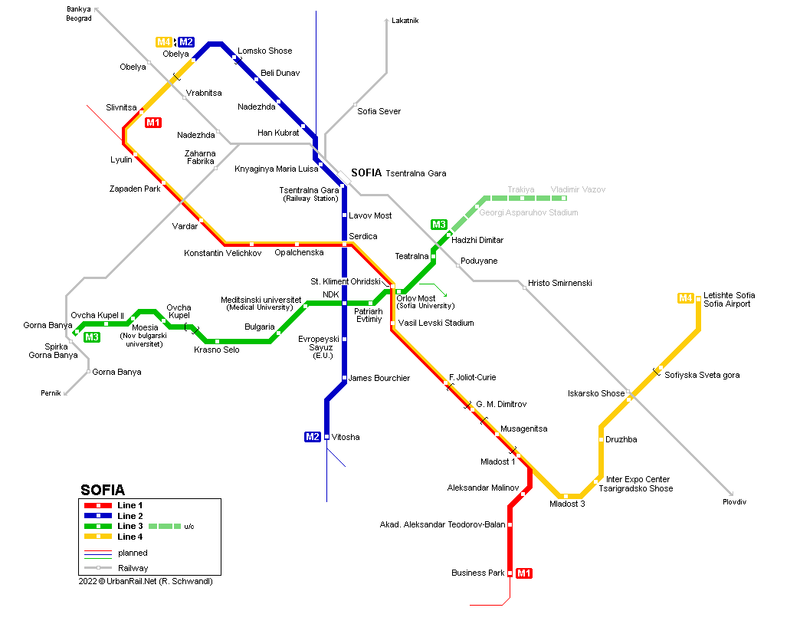 Thanks to Sigrid Berka for the help! 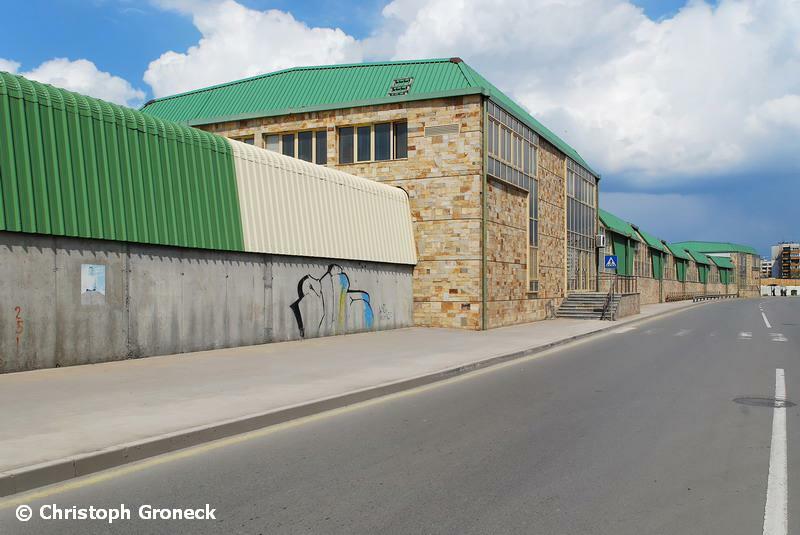 All photographs thanks to Ulrike Zomorrodian and Ulrike Hofmann (except Obelya© Ognian Nedelchev)! 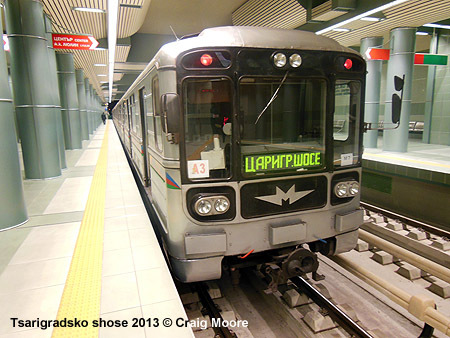 Thanks to Vasko for the update! 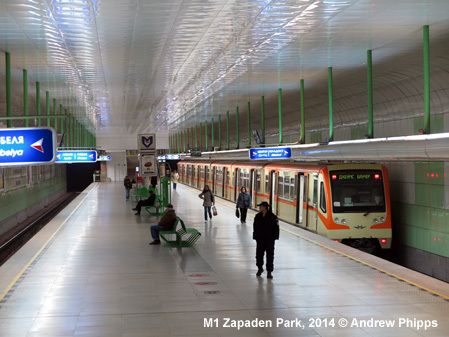 Also thanks to Metro Sofia!